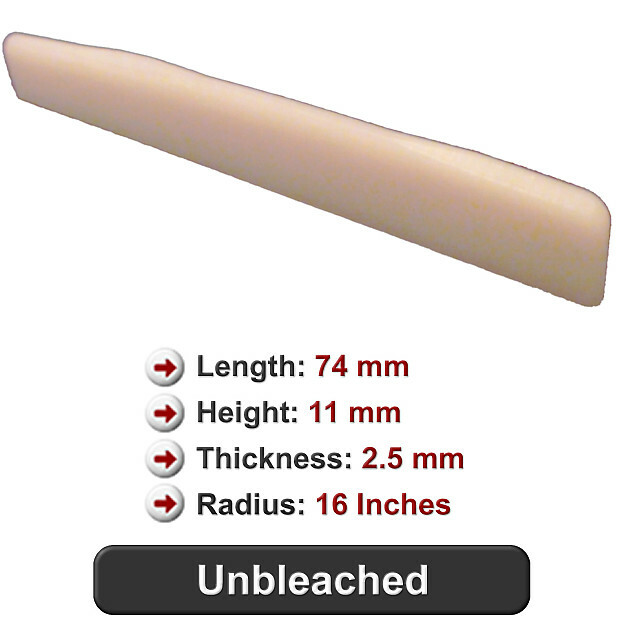 Unbleached bone is a harder material than bleached bone is, and will produce a different tone. Many guitarists prefer the tone of unbleached bone. Unbleached bone has a creamy, but inconsistent color. Please note that color will vary. This acoustic guitar unbleached bone saddle will fit many Martin Guitars as a replacement or upgrade. Please note that this will not fit guitars with saddles that go entirely through the bridge lengthwise. This bridge saddle is compensated for improved intonation, and with the radius set at 16 inches to match most Martin fretboards and improve playability. Please note that fitting is required for each individual guitar. Dimensions - Length: 74 MM, Height: 11 MM, Thickness: 2.5mm.